Fiona Vasile. 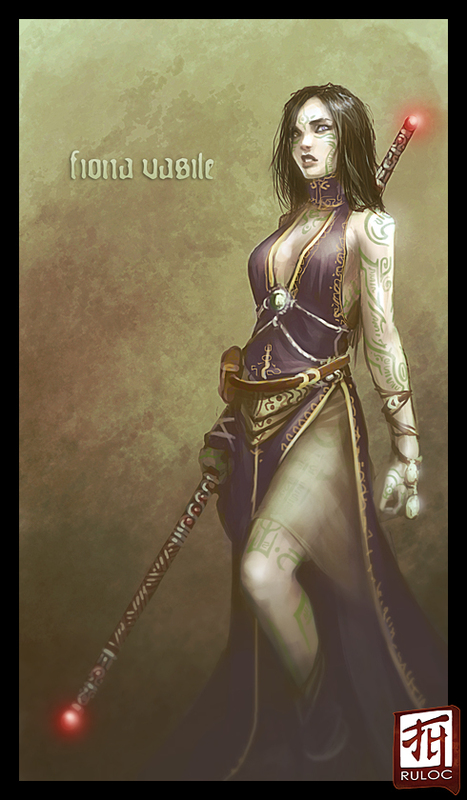 She is a Varisian Changeling, a Tattooed Sorcerer who worships Desna and has practiced the arts of Harrowing on her free time. She's only 5'3'' tall, has a slight but noticeable hourglass build to her and green Varisian-styled tattoos across her body that contrast with her unusually pale skin. Her left eye is violet while her right one is golden in color. She also has long, black, unkempt hair and robes similar to those that Seoni wears, though they are purple (plus some other color if any fit) in color.